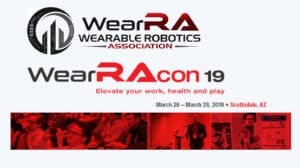 Brand new exoskeletons, quantifying gait rehabilitation, an insurance forum on wearable robotics and an update on ASTM standards development – all in the 3rd day of the Wearable Robotics Conference WearRAcon19! In addition to the automotive forum, something new to WearRAcon19 was the addition of an insurance forum. It makes sense to engage insurance companies early when dealing with disruptive technology. Normally when we talk about insurance companies and exoskeletons it is usually in relation to reimbursement for medical wearables. During the insurance forum, Delia Treaster, Ergonomic Technical Advisor for workers compensation insurance had a different point of view. From her point of view, exoskeleton developers need to ensure that industrial exoskeletons address the injuries most often seen by worker’s compensation. Nursing aides and orderlies continue to suffer abnormally high injury rates. Patients are heavy, and with the obesity epidemic in the U.S. getting heavier every year. Exoskeletons have “high potential for injury reduction” but also a “high potential for unintended consequences.” There just isn’t long term data on the effects of using an industrial exoskeleton continuously for two or more years. The insurance forum extended over several sessions that explored the many different aspects of introducing the infant wearable robotics industry to the centuries-old insurance industry. 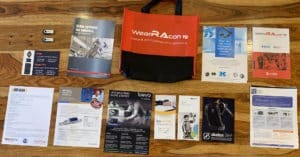 If insurance isn’t your thing, the third day of WearRAcon19 offered some excellent counterprogramming on the medical track. Gail Forrest, Associate Director of the Center for Mobility Rehabilitation and Engineering Research and the Director of the Center for Spinal Stimulation, Kessler Foundation held a wonder breakout session on the impact of medical powered exoskeleton control systems. Dr. Forrest compared the effects of using the ReWalk™, EksoGT™ and Indego® powered exoskeletons for walking assistance. According to her research, the difference in control systems has a measurable impact on the user. For example, the different control schemes and control modes also change which measurable parameters influence walking speed. This is not a comparison if one lower body exoskeleton is better than the other. 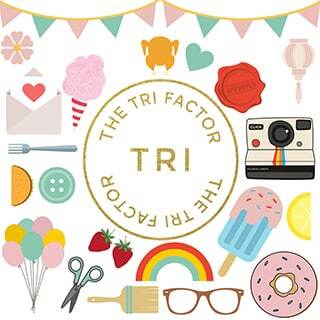 Rather, it is a bold step forward in quantifying what variables end up influencing key performance metrics. 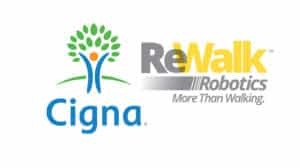 It is possible that over time medical rehabilitation robotics will become fine-tuned to focus on specific outcomes like gait symmetry, walking speed, foot clearance, etc… The exoskeleton control software and changes in the software are providing new possibilities in rehabilitation. 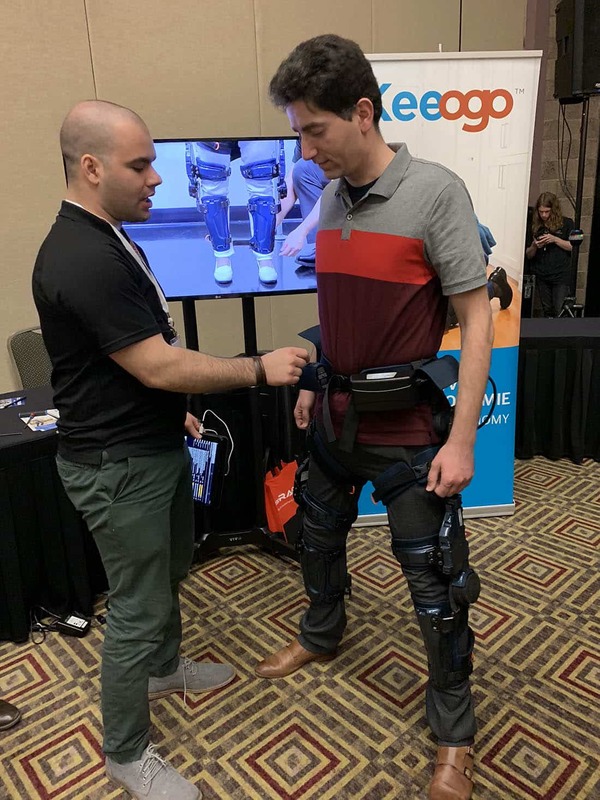 Next, the three powered exoskeletons already being investigated will be joined by the Keeogo by B-Temia and ReStore by ReWalk. There is enthusiasm from the design engineers and enthusiasm from the clinicians but we still have to connect the dots and provide proof of efficacy. Dr. Karen Nolan, Senior Research Scientist also from the Kessler Foundation presented medical exoskeletons from an often overlooked point of view: not that of the user, the developer or the evaluator, but that of the rehabilitation professional that has to administer the gait training. The first step of medical devices is getting the therapists and clinicians to be confident before having to worry about if the technology is useful to the user. You can’t just throw a medical exoskeleton on a person. The Kessler Foundation has a 10-week guideline for gait training focus areas. The clinician needs to have the necessary skills to quickly troubleshoot the unit while on the user. This is key to make the device successful. There a lot of challenges that need to be figured out. How do you transport an exoskeleton from one floor to another? How is each adjusted from patient to patient? How to change the battery if it runs out in the middle of a session? The rehabilitation program is not just interested in walking speed, which is noticeable and easily observable. From an outcomes point of view, weight shift and gait symmetry can be just as equally important. Similarly, videos show patients walking with exoskeletons, but pre-gait exercises such as side-stepping and squatting, while not very cinematic are also vital. 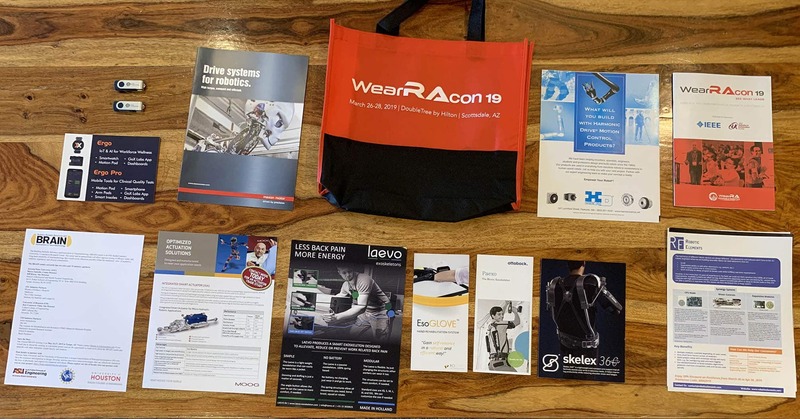 Identical to previous years, WearRAcon19 included an exhibition floor where buyers, suppliers, researchers, developers, and innovators could rub shoulders together. 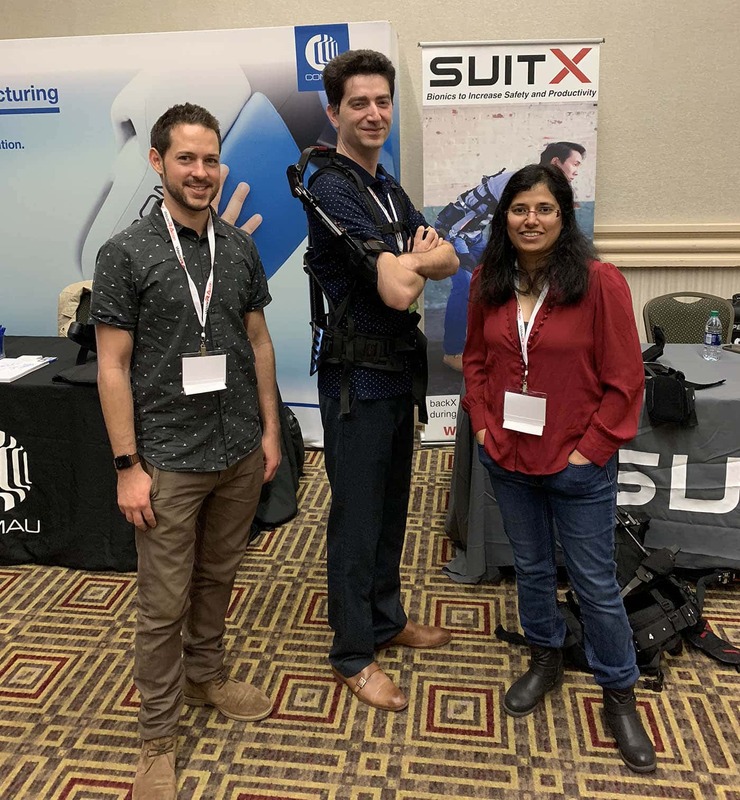 Similarly to WearRAcon18 when Ottobock brought a prototype of their new shoulder support exoskeleton, the Paexo, suitX brought their brand new version 3 of the shoulderX. The new version has a significantly reduced weight, a more ergonomic back support interface and an improved fit and cooling characteristics without sacrificing any of the lift assist. Also returning with a new product is Dr. Yap Hong Kai from Roceso Technologies. We first met Dr. Yap Hong Kai when he was still a student at the WearRAcon2017 innovation challenge. That year, his inflatable power glove for rehabilitation was not the winner, but that did not seem to discourage him at all. 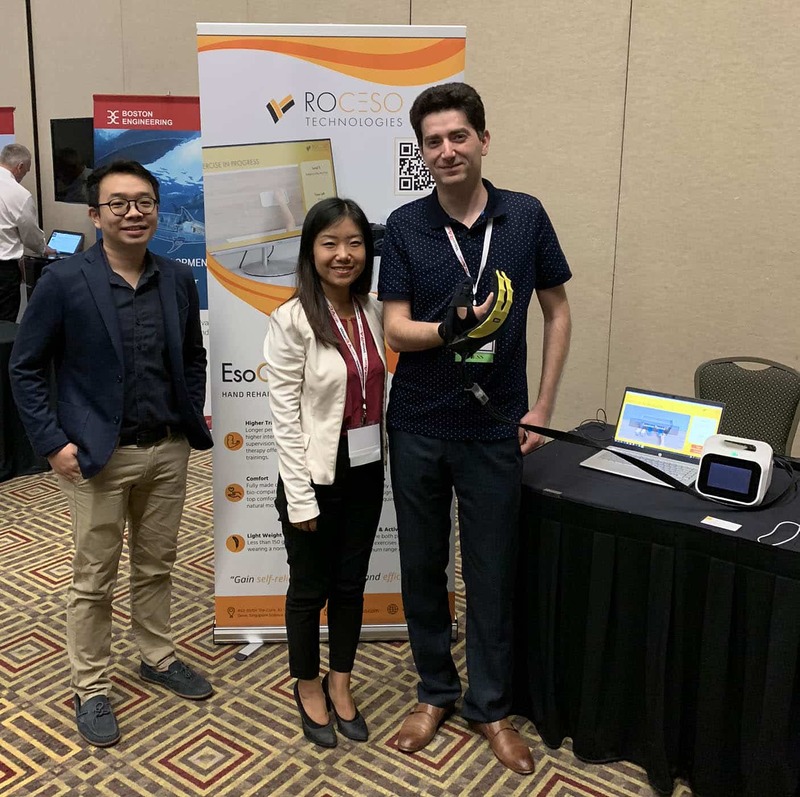 He was back again at the WearRAcon series as a co-founder of Roceso Technologies and a brand new inflatable power glove, the EsoGLOVE™. The new glove includes separate inflatable actuators for closing and opening the hand. Roceso Technologies also used the services of product engineers to create a sleek, modern look for the EsoGLOVE™. 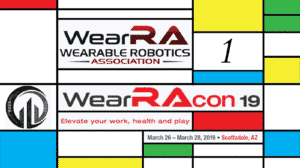 The WearRAcon series is an intersection point for the entire wearable robotics industry. It opens up a window to the world of exoskeletons and exosuits far greater than what can be gleaned from videos and written publications. For example, while Ivanka Trump was trying out the Levitate exoskeleton at Toyota Motors, WearRAcon had already been a host for the members of the design team, evaluation team from academia and members Toyota Motors. This year, the third and final day of the conference did not have to be an ending for wearables enthusiasts. ASTM F48 on Exoskeletons and Exosuits held its first face-to-face meeting for the year at the same venue. All WearRAcon participants were invited to join in to hear the report outs from the subcommittees and weigh on the voluminous work being done. 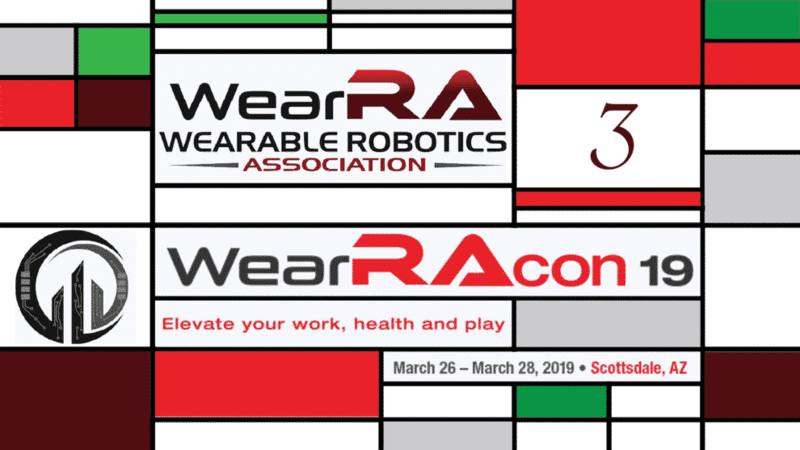 WearRAcon will return on March 30 – April 1, 2020, at the DoubleTree Resort in Scottsdale Arizona!